The latest Bollywood personality to be accused of sexual misconduct is singer Abhijeet Bhattacharya. 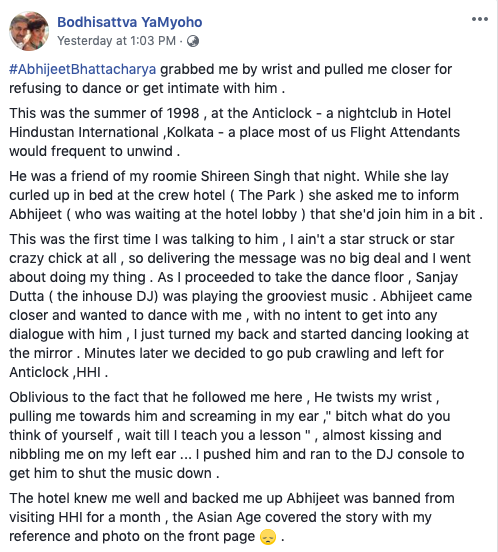 A former flight attendant has accused him of sexually harassing her at a Kolkata pub in 1998; she shared that Abhijeet grabbed her wrist and pulled her closer after she already refused to dance with him. She further added that her saying no angered him and he screamed in her ear, “B***h, what do you think of yourself, wait till I teach you a lesson,” before almost kissing and nibbling her ear. Bhattacharya has denied the allegations in a statement to DNA India,stating “I’ve never visited a discotheque or a pub in my life, so she is blatant lying” before, according to the publication, proceeding to abuse the woman. “I have never gone to pubs in my life. You’ll never find me at any page 3 or filmy parties. My name sells. If someone’s benefiting from it, good. Sometimes earning their bread and butter with my name, it’s fine,” he added. For the uninitiated, this isn’t the first time Bhattacharya has been violent towards a woman; he has gotten into trouble multiple times for abusing women and in 2015, the Indian police had booked the singer for allegedly molesting a 34-year-old woman. Previous articleRemoval of IG Punjab: Did Chauhdry Pervaiz Elahi convince IK to remove IGP?